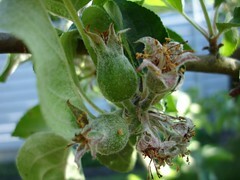 Two years ago my little semi-dwarf Red Gravenstein Apple tree had it’s first crop of about 20 apples. I was thrilled! I ate them fresh off the tree, made a couple pies, and dreamed of what would come the following year (last year) since fruit crops will increase over time. Well, mostly that’s what happens. All fruit trees have cycles. Crops will be heavier some years and they have a "resting" year, where the crop will be really light. Last year was my "rest" year and being such a young tree really light meant no apples at all! I was so sad. 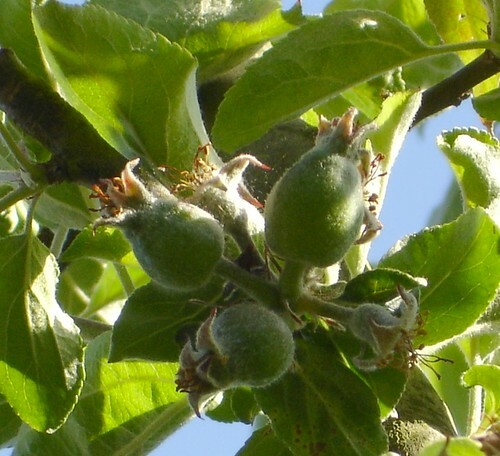 This year, however, the tree was covered with blossoms and I can already see lots of little baby apples making their way into the world! Hooray! The tricky part now is that I didn’t do worm prevention when I should have. :-( I’m going to have to keep my fingers crossed that not too many are affected… And I probably should thin them so that the fruit quality and size is better. I hate killing the babies, though. We’ll see if I actually ever get around to it.